"What number do I dial for room service?" When you brought Tuffy home, eager to make a happy habitat for him and promote a healthy life, it might not have crossed your mind that at some point you'd be taking an extended trip. You can board your parakeet while you're gone, but consider all options before making plans. Even small communities usually have boarding facilities that will put up your parakeet while you're out of town. Research local facilities before making reservations. Most should be open to taking a parakeet since they're smaller and not as loud as larger birds. Take a tour of each kennel or pet hotel so you can see what conditions Tuffy will be living in while you're away, and find out how much interaction he can expect from the staff. The fact is, a stay at a boarding facility can compromise Tuffy's health through exposure to infected others. Find out if the facility you're considering requires certificates of health for the birds they board, and ask about sanitary measures the staff takes when interacting with and handling birds. If no facilities in your area board parakeets, ask your avian vet if she boards. The prices are typically comparable to boarding at a pet hotel or kennel, but there are advantages of boarding Tuffy at the vet's instead. He'll already be in the perfect place in case of a medical emergency and he'll be cared for by professionals who not only are trained in parakeet care but may know him personally. He may find that element of familiarity reassuring. When boarding Tuffy, whether at a hotel or the vet's, take his cage with him. 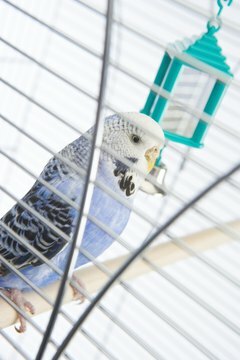 It's better for your parakeet to have his own cage for a sense of comfort and familiarity in strange surroundings . Also, you won't have to worry about the sanitary conditions or the previous occupant of boarding cage. Allow all his belongings that are typically in the cage to remain inside, like toys or a nesting tent or hammock. Feeding and feed may be part of the bird hotel's fee, but if what they'll feed is not the same as your parakeet's regular diet, pack his food along with feeding instructions. Make sure the hotel staff has emergency contact information and the vet's information, too. If there's no room at the inn and your vet doesn't board, you could consider a bird sitter. If Tuffy is shy, doesn't respond well to change and isn't used to having a lot of activity going on around him, a sitter may be the preferred option anyway. Although bird sitters won't be with your parakeet 24/7, the bird will get daily one-on-one interaction in the comfort of his own home. Typically a bird sitter will be able to work around Tuffy's usual schedule, and you won't have to schlep him and all his belongings across town. You may or may not be able to find a local bird sitter, but if you have a friend or near relative whom Tuffy is fond of, you may be able to enlist her help in caring for him while you're away. Why Do Dogs Bark and Chase People? What Kind of Cat to Get if You Live Alone?